Today we are launching a preview of the Android Things Console. This console allows developers to manage the software running on their fleet of Android Things IoT devices, including creating factory images, as well as updating the operating system and developer-provided APKs. Devices need to run a system image downloaded via the Android Things Console in order to receive future updates, such as the upcoming Developer Preview 5. Google provides all of the infrastructure for over-the-air (OTA) updates, so developers can focus on their specific application and not have to build their own implementation – getting their IoT devices to enter the market faster and more securely than before. Let's take a tour of the console, and see the features it offers. The developer first defines a product, which includes selecting a name and the type of System-on-Module (SoM) that the device is based on. Many developers want to use Google Play Services when building IoT devices, and this is configured here as an optional feature. 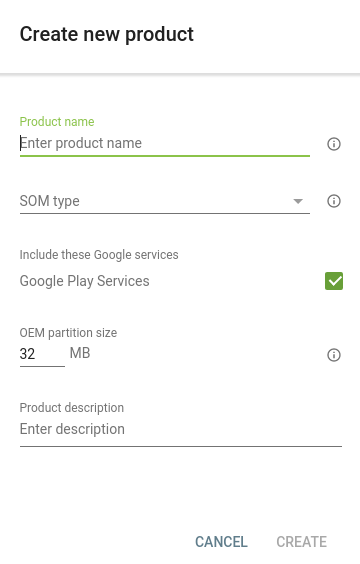 The size of the OEM partition is also configured, and must be large enough to include the size of any future APK growth. A device needs an initial base firmware to receive future updates for the correct product from your console. 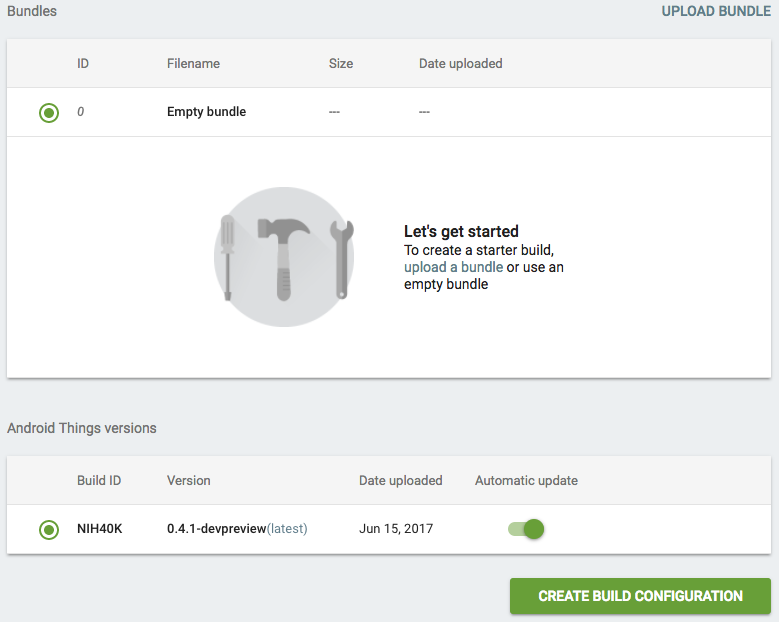 For starters, you can simply use "Create Build Configuration" to build a default factory image with an empty bundle that is configured for your product. This factory image can then be downloaded and flashed to your device, and you can start developing on it by sideloading an APK. Later on, once you have prepared an application that you would like to deploy to all the devices in your product, you can upload a bundle to the console. This bundle is a ZIP file that contains a main APK file, user space drivers as a service in an APK, and any additional APKs launched by the main APK. A bootanimation.zip file is also supported, which will be displayed during boot up. The uploaded bundle ZIP file is then used to produce a complete system image that can be deployed to devices. More information about the bundle ZIP file contents is available in the documentation. This tab allows the developer to select which system image should be pushed to the fleet of product devices. The developer selects one, and then "Push to Devices" starts the process. The update will then be securely pushed to all of the devices, installed to one of the A/B partitions, and made active when the device is rebooted. If any failures are detected, the device automatically rolls back to the previous known working version, so future updates are still possible. Developers will be able to test new releases of Android Things in advance and decide whether devices should be updated automatically. The Android Things Console is currently a preview, and we are working on many more features and customizations. We encourage all Android Things developers to check out the Android Things Console and provide feedback. You can do this by filing bug reports and feature requests, and asking any questions on Stack Overflow. To learn more about the Android Things Console, read the detailed documentation. We also encourage everyone to join Google's IoT Developers Community on Google+, a great resource to get updates and discuss ideas.